Trying to understand the ongoing Trump/Russia developments is becoming harder, and not just because the story itself is growing more complex and multi-layered. Much of the reason is that news organizations in a polarized media landscape have all functionally picked a side in the core value of the story, and appear to use that to frame each new development. In other words, every new development gets put through the machinery of media outlets, and gets turned into a story digestible for their audience. The total product of these individual processes within news organizations is that discerning what is important or unimportant in the Trump/Russia story is becoming impossible or wholly dependent on the source of the story. Understanding legitimate versus fake news is not simply a matter of parsing truth from fiction, but of navigating a landscape where every outlet posits a fundamentally different image of where the ‘true story’ is, if there is one acknowledged at all. Al Bawaba ran a cursory analysis over several major media outlets that are traditionally considered center-left, centrist, and right and found that for many, the opaque Trump/Russia story boils down to one simple binary: either there is collusion, or there is not. But the implications borne from these options entail massively divergent understandings of American democracy, who can and cannot be trusted in politics and media, and who the ‘bad guy’ is. Predictably, there is no consensus. In the contemporary media landscape, information is less an object to inform and challenge electorates and those in power, but a tool to reify a given worldview. Different media outlets have various editorial standards for fact-finding and checking, and this analysis is not intended to grade each on their individual merits as outlets. Some here, like Infowars, are considered outright conspiratorial. Rather, selected outlets were selected because they were influential in informing the public about news, regardless of reputation, and evaluated how their framed the Trump/Russia story. This is a table showing the total number of stories published about Trump and Russian, and the possible collusion between them. Used as samples to depict the different major sides on the issue are: MSNBC, The New York TImes, Vox, CNN, Politico, Fox News, Infowars and Breitbart. MSNBC, NYT and Vox are generally considered left-leaning, whereas CNN and Politico bill themselves as staunch centrist publications. Finally, Fox News, Infowars and Breitbart are right-leaning media outlets. The first impression the numbers gives is that the Trump/Russia story, in every iteration, is huge. For each outlet to have so many stories consistently published about it reveal the perceived importance of the matter. 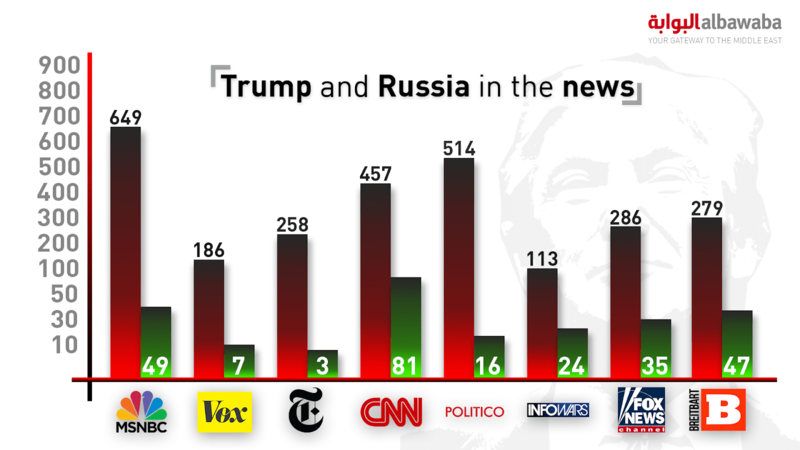 The right bars show the number of stories published from each that discuss Trump and Russia generally, while the green bar shows the number of stories published that contain the word ‘collusion’ in it. Al Bawaba has selected the word ‘collusion’ to be analyzed as it is a particularly heated word to describe the events unfolding. Whether or not there is collusion, and who is doing the colluding, is the implicit or explicit focus for every news development and investigative finding thus far. From a cursory glance at the content of the stories revolving around the existence/non-existence of collusion, it is clear that left-leaning news organizations are less active than right-leaning organizations in discussing potential collusion. MSNBC’s coverage tends to focus on developments on the Mueller investigation, new questions emerging about potential Russian interference and attempts to cover them up, new details that make the story more complicated/multi-layered, and desperation on Trump’s part to stop the investigation. Vox tends to focus on Trump’s lies, Mueller’s chances of securing indictments, and pushing an insistence that there is evidence of collusion. The New York Times is the least active left-leaning outlet that describes the situation using the world ‘collusion,’ but has stories arguing that Russia wanted Trump to win and Russia wanted ‘to get caught,” while repeating Trump claims denying collusion. Taken in sum, they serve to validate both the importance of the investigation and the emerging truth that there was indeed collusion between the Trump campaign team and Russian agents. Right-leaning organizations, meanwhile, are remarkably uniform in their framing of the story. While they are, on average, more active than left-leaning organizations in describing the story in terms of ‘collusion,’ most of their stories on the matter outright dismiss or deny that anything constituted collusion. What’s more, many stories from each set out to show Democrats reportedly colluding with Russians to take Trump down—an outright reversal of the story that pins the blame squarely on Democrats. If it was common to cross ideological lines and read news from multiples sides, it would be nearly impossible to decipher any semblance of a shared truth: each side would cancel each other out. However, as the Pew Research Center reveals, very few people do this. Instead, many people simply rely on sources they trust, which often means relying on sources that reify their worldview or confirm ideological positions. As a result, it seems harder than ever to understand what is happening with the evolving Trump/Russia story. In news stories, there is generally a consensus that something is happening, but in this wide-ranging story, many articles on the right insist that others are on a witch hunt, trying to catch a ghost or simply pointing the finger at their side to cover up the fact that the Democrats were the true colluders. For the left’s part, every new piece of evidence seems to pile onto something bigger than the infamous Watergate scandal that shook the U.S. under former president Richard Nixon. While occasionally acknowledged to only be a fringe issue in deciding the election, it is nonetheless treated as an existential threat to the integrity of U.S. democracy.